The ribbon is the central control element of Password Safe Version 8. It is available in all modules. 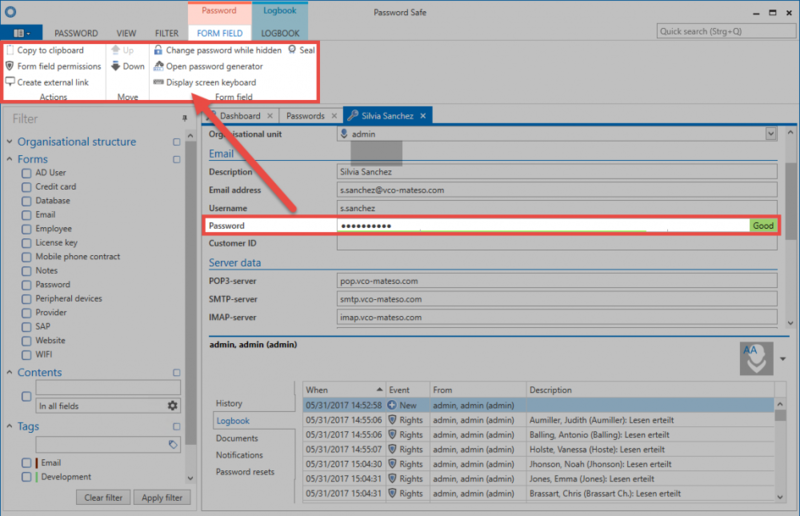 Password Safe is almost always operated via the ribbon in the header area of ​​the PSR client. The features available within the ribbon are dynamic, and are based on the currently available actions. Various actions can be performed, depending on which object is selected. The module selected also affects the features that are available in the ribbon. Of course, the most important actions can also be controlled via the context menu (right mouse button). This mainly affects the very often used features such as opening, deleting or assigning tags. However, a complete listing of the possible actions is always only possible directly in the ribbon. This ensures that the context menu can be kept lean. There are tabs in the header area of ​​the ribbon that summarize all available operations. By default, module-independent * Start, View, and Filter * is available. If the footer of the reading pane is opened (1), further tabs will be visible in the ribbon (2). These contain, according to the selection made in the footer, other possible actions. Double-clicking on an object in the List view opens a new tab with its detailed view. 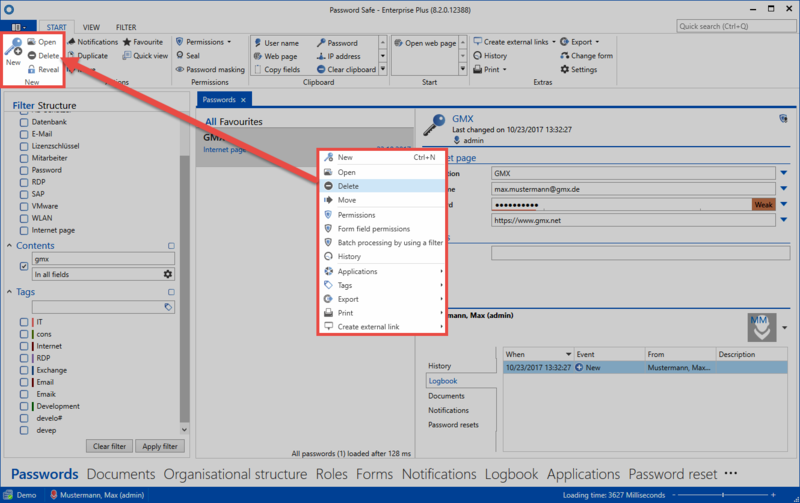 Depending on which form field you have selected, the corresponding content tab opens in the ribbon. 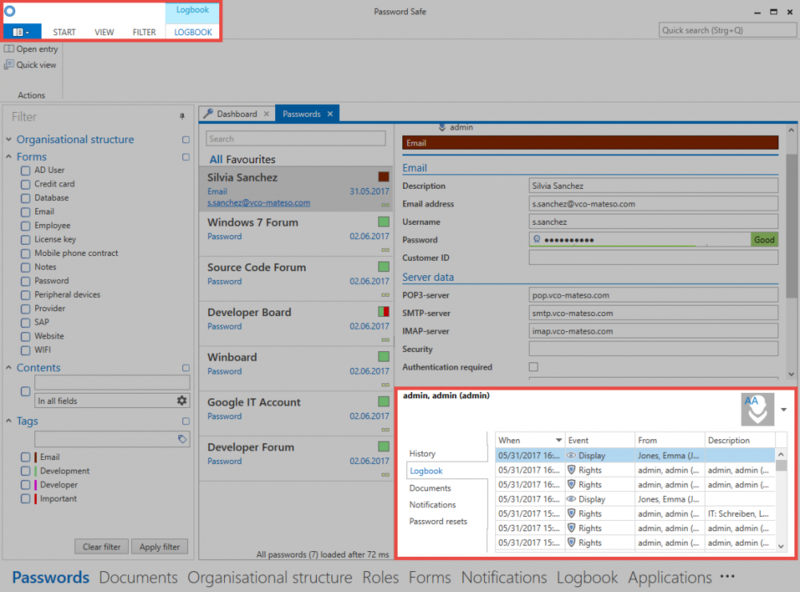 Depending on the selected form field, further actions are offered in the Content tab. In the Password field, this is, for example, calling the password generator or the screen keyboard, or the possibility to copy it to the clipboard.